Located in the Van Wyck Brooks Historic District comprised of 146 structures famous for the stunning brick Victorian Homes. 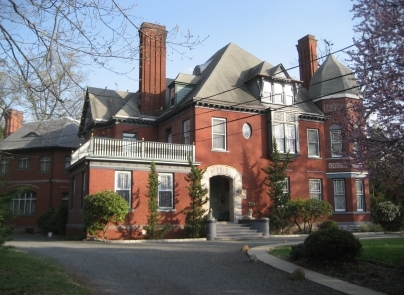 This 1886 Victorian Mansion has 30 rooms, 15 bedrooms, 10 baths, 11 working fireplaces, all newly updated! House is in Pristine conditon with Decorative Wood details as Raised Paneled Walls, Coffered Ceilings, Pocket & French Doors in Mahogany, Walnut & Oak. Many Windows are Stained, Lead & Bottle Glass. Some Living/Great room sizes are 35x25, 25x20, 20x20, 27x16'. Located on 1.25 acres of beautifully landscaped property with over 250 Specimen Trees & Shrubs all fenced in. House has 5 Apartments set up for supplement income while you live in a Mansion!